GEELONG has chosen not to risk Brownlow medallist Patrick Dangerfield for Sunday's season-opening blockbuster against Melbourne at the MCG. The AFL world had been on 'Danger watch' since the 27-year-old hurt his right hamstring in the first quarter of the Cats' JLT Community Series clash with Essendon two Sundays ago. 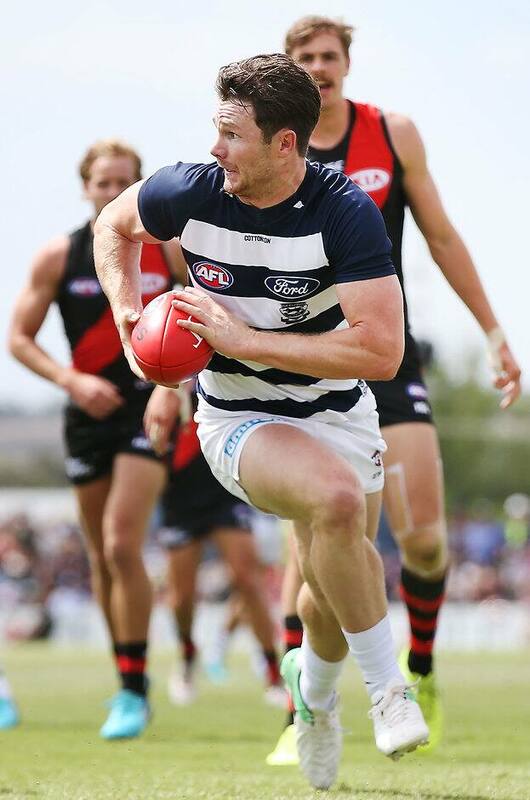 It means it will be at least another week until Geelong's all-star midfield is united, but Gary Ablett will play his first game for the Cats since the 2010 preliminary final. Nakia Cockatoo also missed selection despite starring in last week's VFL practice match. The Demons selected reigning club champion Clayton Oliver (knee), who was also under an injury cloud, as they begin their bid to play finals for the first time since 2006. Nic Naitanui will also make his comeback for West Coast from a serious knee injury that sidelined him for all of last year and interrupted his pre-season. The Eagles named him as their starting ruckman, with Scott Lycett also in the side to take on visiting Sydney at the new Optus Stadium on Sunday. A raft of players – Jake Waterman, Liam Ryan, Daniel Venables, rookie Francis Watson, Brayden Ainsworth – are in line to make their debut, but Willie Rioli wasn't one of them. Jarrad McVeigh (calf) will play for the Swans, but Dan Hannebery (calf) is at least another week away. Sydney has turned to Callum Sinclair to lead its injury ravaged ruck division, leaving untried big man Darcy Cameron out of the squad. Essendon included emerging midfielder Darcy Parish (soreness) in its 22, but the Crows will be without key forward Tom Lynch (side strain) for the Friday night clash. Lynch's absence is a significant blow, given captain Taylor Walker (foot) is also out. Brisbane had been coy about whether No.1 draft pick Cam Rayner would make his debut on Saturday, with a series of rival clubs announcing they were blooding their top-10 selections. But the Lions have ended the speculation, selecting the Western Jets product in their line-up to face St Kilda at Etihad Stadium on Saturday. Former Hawks skipper Luke Hodge and Charlie Cameron, who represented Adelaide in last year's Grand Final, are also in Brisbane's round one team. The Saints named first-choice ruckman Billy Longer, who was battling a hip flexor issue, and had already revealed No.7 pick Hunter Clark was playing. Clark's fellow top-10 pick Nick Coffield and veteran defender Sam Gilbert are among four St Kilda emergencies and 69-gamer Luke Dunstan was left out completely. Hawthorn will unveil ex-Port Adelaide speed demon Jarman Impey against Collingwood, with ex-Swan Sam Murray and top-10 draft pick Jaidyn Stephenson the Pies' new additions. The Hawks had already announced Cyril Rioli will take his place at the MCG on Saturday night despite spending much of the pre-season caring for his father in Alice Springs. Greater Western Sydney has picked both Rory Lobb, who was restricted by a groin injury in the pre-season, and Dawson Simpson on an extended bench, with Jonathon Patton named in the ruck. Tom Scully (knee) missed out on selection along with Jacob Hopper (groin) after both played no part in the JLT Community Series. The Giants play on Sunday against the Western Bulldogs, who named a new-look squad including recruits Hayden Crozier, Jackson Trengove, Aaron Naughton and Billy Gowers. Port Adelaide will roll out a four-pack of recruits against Fremantle, with former Demons Jack Watts and Dom Barry, ex-Lion Tom Rockliff and one-time Cat Steven Motlop all in the line-up. The Power will be without Robbie Gray (suspension). Nathan Wilson, prized No.2 selection Andrew Brayshaw and fellow draftee Bailey Banfield are all in the Dockers' team for Saturday's game at Adelaide Oval. Joel Hamling has been named as an emergency for the Dockers. Newcomers Lachie Weller, Aaron Young and Nick Holman will all make their club debut for Gold Coast against North Melbourne in Cairns on Saturday night. Michael Barlow and 2016 top-10 pick Will Brodie are notable Suns emergencies. Ex-Hawk Billy Hartung and No.4 draft pick Luke Davies-Uniacke are the newest Roos, while Mason Wood is an emergency and Taylor Garner (groin) was not selected.